'We live with the dust, eat it, sleep with it, watch it strip us of possessions and the hope of possessions. It is becoming Real." The dust storm is one of Nature's deadliest, rising up from the wastes to suffocate the landscape. But alongside the devastation, there is something captivating about dust's dark beauty, from the apocalyptic streak of grey at the horizon to the quiet drift of motes in the atmosphere. Despite its natural origins, dust has a creepy, alienesque quality which appeals to me as a reader and a writer. The dustbowl is the perfect setting for offbeat, character-driven narratives. Dust speaks of poverty, barrenness, vigilantism, lone gunmanship, makeshift mechanics, and the endless search for hydration aka salvation. In literary terms, dustpunk is a grittier, desert-based alternative to steampunk. The term is sometimes applied to stories set in 1880s America, specifically the Wild West. For me though the subgenre borrows from 1930s American dustbowl narratives. The landscape is bleak, the people forced to colour it with travelling shows, miracle elixirs, sit-up-and-beg trucks, tumbledown farmsteads and religion. Think Carnivale, The Wizard of Oz's pre-twister Kansas, and John Steinbeck's The Grapes of Wrath, but with a generous dose of the science fictionally weird and mechanically corroded. In many ways, dustpunk is less akin to steampunk than the dystopian ecopunk of Mad Max. Fuel is a scarcity fought for and fought over. Alternatively, old tech mechanics are adapted to suit new fuels derived from minerals or self-sustaining plant life. Either way, dustpunk is not a genre suited to gleaming brass, well-greased pistons and an elegant turn of the ankle; this is a violent wasteland of make-do and subsistence. Which is not to suggest these are stories without hope or wonderment, only that the dust narrative is a rawer breed of 'punk'. Inside its own barb-wire boundaries, dustpunk varies wildly in tone. 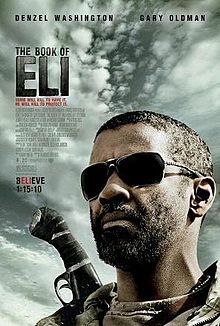 The Book of Eli is an exquisitely dark narrative, the focus being on an epic quest through an often deserted, sometimes violent, setting. In contrast, Tank Girl is a gutsy, girl-with-gun riot laced with humour and the downright peculiar. Solipsist Films have recently brought the rights to a vampire story set in the dustbowl of 1930s America - the as-yet-unpublished graphic novel, In The Dust, written by George Mahaffey. My own stories range from the dustbowl mining planet of Cyber Circus to the desiccated coral bed of Deluge. Both are themed around scarcity, corruption and geological wilderness. Steampunk is often accused of superficiality, in particular of aesthetics taking priority over substance. But this is where it is important to emphasise the 'punk' aspect of these alternative histories/other worlds. Dustpunk's edginess is quite literally grounded in its sore earth. Stories should be a darn good yarn, but they should also make readers think and feel. Just like the dust of Avis D. Carlson's 1930s America, they should become Real. 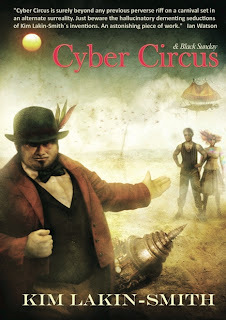 Kim Lakin-Smith's latest book, Cyber Circus, was released in September 2011 from NewCon Press. Kim lives on the first floor of a Victorian gothic mansion house with her mini demon of a daughter and dark lord of a husband. Join us on 8 December at Blackwell's for our exhibition & exploration of this fascinating sub-genre of fantastic literature. Guests include Adam Roberts, China Miéville, Kim Lakin-Smith, Jonathan Green, Lavie Tidhar, Philip Reeve and a host of amazing artists and craftspeople. Plus, Plarchie!